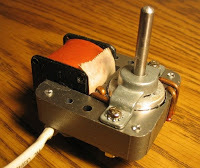 We know that 'single phase induction motors are not self-starting' .To make them self starting we use capacitors,shaded poles etc.In this article we going to see shaded pole induction motors-working, construction.Shaded pole induction motors are very popular for low ratings about 0.05 HP (~ 40 W) because of its extremely simple construction and high performance. 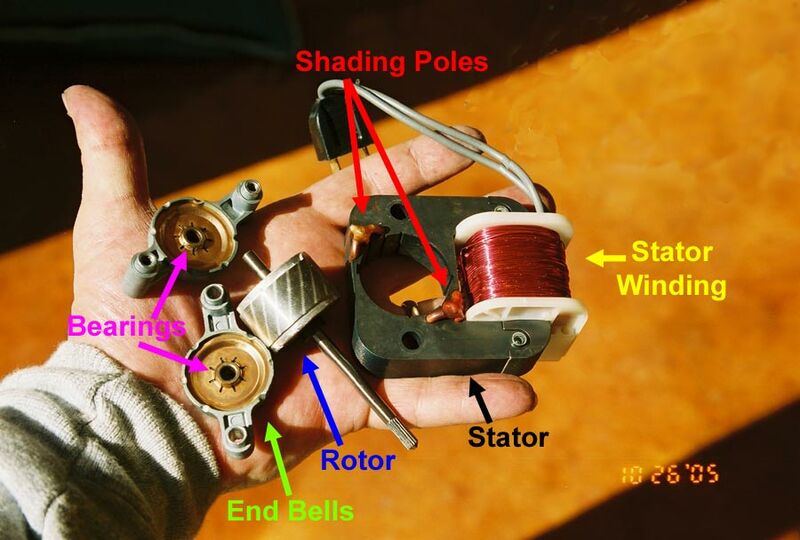 Shaded pole induction motor consists of salient poles(projected poles) on stator and a squirrel cage rotor.Poles are shaded i.e. each pole carries a copper band on one of its unequally divided part called shading ban.You can observe 4 pole shaded poles in below figure. The stator of shaded pole induction motors are also similar to normal motor's stator construction. Usually 2 to 4 salient poles are used. A coil is wounded on it and part of each pole is wrapped by a copper coil.These poles are shaded by copper band or ring which is inductive in nature. The poles are divided into two unequal halves. The smaller portion carries the copper band and is called as shaded portion of the pole.The slot is approximately one third distance from the edge of the pole. Speed of motor depends on number of poles for example at 50Hz supply 2 pole stator gives a synchronous speed of 3000 rpm where a 4 poled stator speed will be 1500rpm. Squirrel cage type rotor is used in shaded pole induction motors.Rotor bars are skewed in 60 degrees to obtain efficient starting torque and for limiting the torque dip during run up.Air gap length will be around 0.25 to 0.5 mm between stator and rotor.It doenst have any extra make ups like commutator, brushes, collector rings etc.This is very cheap in cost, rugged in construction and reliable. Absence of centrifugal switch eliminates the possibility of motor failure due to faulty centrifugal switch mechanisms. Alternating flux is produced by input ac supply.We can observe waveform of the flux in below figure.The distribution of this flux in the pole area is greatly influenced by the role of copper shading band.Now assume our ac supply as sine wave as shown in 1. In OA portion the alternating-current cycle , the flux begins to increase and an e.m.f. is induced in the shading coil. The resulting current in the shading coil will be in such a direction (Lenz’s law) so as to oppose the change in flux. Thus the flux in the shaded portion of the pole is weakened while that in the unshaded portion is strengthened as shown in figure 2. During the portion AB of the alternating-current cycle, the flux has reached almost maximum value and is not changing. Consequently, the flux distribution across the pole is uniform [Fig 3] since no current is flowing in the shading coil. 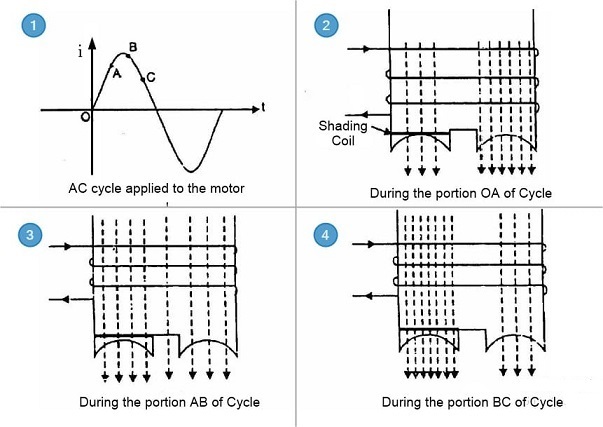 As the flux decreases (portion BC of the alternating current cycle), current is induced in the shading coil so as to oppose the decrease in current. Thus the flux in the shaded portion of the pole is strengthened while that in the unshaded portion is weakened as shown in Fig 4. The effect of the shading coil is to cause the field flux to shift across the pole face from the unshaded to the shaded portion. This shifting flux is like a rotating weak field moving in the direction from unshaded portion to the shaded portion of the pole.The rotor is of the squirrel-cage type and is under the influence of this moving field. Consequently, a small starting torque is developed. As soon as this torque starts to revolve the rotor, additional torque is produced by single-phase induction-motor action. The motor accelerates to a speed slightly below the synchronous speed and runs as a single-phase induction motor.